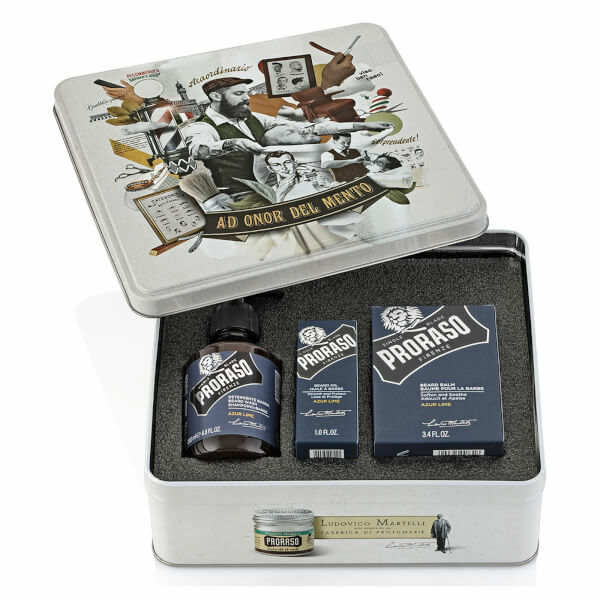 Take care of your facial hair with the Proraso Beard Care Tin in Azur Lime. The gift set brings together three products to cleanse, nourish and condition your beard, all of which are infused with invigorating and uplifting scent. A lightweight cleanser specifically developed for facial hair. Unlike regular shampoo that can cause irritation and damage to delicate facial hair, the low-lathering formula contains no harsh chemicals and is suitable for daily use to keep your beard feeling fresh and balanced. Fortified with a host of natural extracts, it sweeps away daily dirt and neutralises odours with a sensual scent of Citrus and Mint. A rich, daily treatment to help tame facial hair. Formulated with nourishing essential oils and powerful natural extracts, the oil helps condition and hydrate hair, creating a softer texture and enhancing regrowth capabilities. Suitable for use on stubble as well as fully grown beards, it imparts a masculine scent of Citrus and Mint to invigorate and refresh. Soften and condition facial hair with a lightweight formula that softens hair and keeps skin feeling fresh. It’s ideal for the first few weeks of hair growth, helping to reduce feelings of itchiness and discomfort while infusing skin with moisture. Zingy accords of Citrus merge with Mint for an uplifting scent.